Once upon a time I had a Dad who was alive in this world and he loved music. He loved to listen to it cranked up so that it drowned out whatever he was tinkering with in the shed. If you listened hard you could hear his sighing, gravelly voice joining in with that riffy blues that used to get under the skin at the base of my neck and make me want to shrug like Atlas. The blues gave them to me then, and they give them to me now. Thankfully, he loved many other styles of music, with a record collection stretching from Abba to Zappa like a long line of Friday afternoon bank customers, craning their necks to see when it would be their turn on the table to start the party. His tastes expanded mine from 3XY, giving a breadth that allowed me to take in more than the latest chart topper, and aged my repertoire so that I often have people older than me take in my skin, and try to figure out my generation when I know the words to something before my time. He taught me that music is to be shared and pooled and mixed together and made available to all. He was always a one for making tapes of the albums he bought home from Brashs most Fridays, taking them out of their slippery sleeves to check for scratches before reverently placing them on the turntable. I think he held his breath a little until the crackles gave way to the opening bars. And then he was away. Lost in the story and the emotion. The first time I heard Mental As Anything we were at our holiday place at Torquay, where the salty west-coast winds flapped the canvas roof up and down all summer long, reminding us to get to the beach before the cool change came in. My Dad had made a TDK-60 recording to play in the black tape-recorder that sat on top of the 1950s fridge (Current paint job: royal blue). “Woah-ho, the nips are getting bigger.” sang Greedy and his buddies, the flippy tune forming an exuberant sound-track to my latest Trixie Beldon. It was the one where they found some dope-smugglers and when I asked Mum how to pronounce “Mara-jewu-wana”, she snatched it away with a black-snake whip, until I could convince her that Trixie and Honey were catching the baddies, not sparking up. I spent most of the rest of those hols, humming along to the Mentals, and laughing to myself about how a song about fishing and the nips they were getting, could be so catchy. Last weekend, Greedy and a new gaggle of fellas came to a little country town near us. Reg has gone onto other things, and Martin is pretty crook, but Greedy was there, playing his keyboard and belting out all the old tunes as if it was 1986. At first I thought I might stand politely up the middle-to-back and have beer or two (I started out, just drinking beer.) and maybe lip sync a few songs then head home. However the first notes of the fist song did something to my synapses and within a beat I was back in that summer. White zinc cream mixed with that hard, peeling skin on my nose. Lips infused with salt. Hair faded to light from the sun. Sandpaper sheets, and still, melting heat making it hard to sleep, whilst parents caroused- the cadence of their laughter and stories a backdrop to the click of the crickets. Eventually silent, only moments before the crows started their morning dance on the thick canvas roof. We would toss and turn and try to scrinch out the light, until the paperboy started his litany, “SunAgeAddyAustral-yan” and bleary-headed Dads in their jocks ran out to grab the news of what they were missing from their city lives. So when Greedy started, I wove my way through the crowd like an eel, taking my place among the old and the young. The Old who were swaying to the echoes from a simpler life. The Young who were there for the cheap live music, or, in one girls case, because her Mum had loved The Mentals. I sighed with her, and kissed her maternally on the head as she told me her story of loss and scattered corpuscles, and we toasted her Mum and we toasted my Dad and we toasted the silly, fizzy soundtrack that could take us back to a time and and place where our hearts were still whole and unscarred. Where we could live it up. Thanks Fellas, You’re still Mental As. Last week I scored a magnificent bargain. I was flicking around on Facebook, when one thing led to another, and before too long, I managed to procure what may (or may not) be the deal of the century. I found a woman on Bribie Island who was willing to sell me her deceased grandparents’ record collection for two pineapples. Or five lobsters, in the old measure. I couldn’t believe my luck. For not only did she want to sell for a song, Nathan and the kids just happened to be kind-of-almost-sort-of going past Bribie on Saturday. So I got a lifetime of someone’s music (or muzak as it should rightfully be called) without an ounce of effort. That’s the kind of Christmas Sale transaction I like. Can you read the text? It’s a SPACE AGE device! I was deliriously happy as I spun disk after disk, finding that by some freakish sorcery, the words to these songs were stored in the back recesses of my gyri, intact, after all these eons. Lyrics to songs that, if you asked me, I would say that I am only vaguely familiar with, came flooding back as soon as the first verses began. Sometimes I was a bit behind- like when you do that thing with your friend, pretending to guess what the other will say, speaking the same words at the same time in a kind of slow motion- but often I was right on time, knowing the words as if they were my favourite songs, now playing on 3XY. I found a surprising joy in this. In finding that my brain somehow knew some things that I don’t. It was like there was me, and then another me, both sitting on the couch with a beer, familiar together, yet not quite sure what the other one would do next. I remember the cover distinctly- Mum had it when I was a kid- and I knew it contained the tracks Disco Duck and Cherry Bomb, but other than that, nothing. It turns out that Old Me has some bytes of information stored up, and she knew all of the words, to all of the songs, even ones that New Me doesn’t really like. What fun. And what else is stored up there? Do I secretly know how to play piano or speak German, two things I have been exposed to, but have no working memory of? And if there is more up there, how do I get it out? In the end I guess it doesn’t really matter, it will all come out when I’m old(er) and nuts and asking my children as they change my Depend, for Choo Choo Bars because they were-are my favourite confection, circa 1978. Nathan and the kids were vaguely interested in all of my nonsense, but by and by they grew tired of the crackling and the scratchings of the turntable, and decided to introduce my to the soundtrack of their Saturday drive: Uptown Fudgey Wudge. My synapses hurtled through time and space, one moment dealing with the tricky intricacies of stuffing those thin black circles pressed with the voices of The Temptations from long ago, into those strange clingy bags, to the next, downloading the latest Mark Ronson track (which is actually called Uptown Funk, if you wanna do yourself a favour and go listen) and having it almost immediately available to listen to with the caress of a screen. So we jumped and funked and grooved around the dance-floor to something that some guy probably could have made in his bedroom, and beamed to my phone the second after he pressed the STOP button on his Garage Band app. It’s probably not how it happened, but it could have. And that’s the crazy bit of Uptown Fudgey Wudge vs Karma Chameleon. Both are hits in their time. And both are fantastic in their way. Both make your feet tap and your brain smile. Both know how to pick you up and shrug off some of the load. This morning as I write, I am looking up from time to time at the mountain of vinyl shoved in the corner, and I see I have inadvertently placed the early birthday pressie I procured for myself from Typo last week, on top of it. Thanks Joy B. Thanks for taking the time to collect the songs of your life, carefully writing your name on their covers so that I can send you a cheers, whenever I take them for a spin. You made me Happy. Do you still have a record player (yes, I know it’s now called a turntable)? What songs are on the soundtrack of your life? Clearly I am a liar, because at 43years of age, I have barely ever picked up any instrument, other than to move it out of a thoroughfare in this hovel we call home, or to wipe dust off it. In this house there are: two ukeles, one drum kit, one violin, two guitars, one clarinet and various blues harmonicas. Along with a keyboard that comes to visit every now and then. So it would seem that it isn’t a scarcity of equipment that has prevented my burgeoning musical talent from blossoming. The reason why I can‘t play is because I don’t. This week I decided to remedy that, and in a pique of inspiration I did what I always do when I don’t know the answer in this brave new world: I ask Google, or someone under fifteen. “Piffle”, I thought to myself, and did the next thing my goal book said to do to successfully achieve something: I told Nath (loudly) that I was off to learn the guitar, and I would be back with a song presently. By and by, after many repeat viewings of the YouTube clips my new friend Stephen put together for me, my neck began to ache from hunching over the frets, and my fingertips slowly lost any semblance of feeling. Other than pain, that is. They could still feel pain. For even though I was kinda sorta learning the chords okay, the ability to play music requires some other skills to come together. Not only is there all of the intricate movements of the left hand to make the shapes, the right hand has to strum, and the strumming has to follow an unvarying routine, for it all to sound anything resembling a song. Stephen keeps breaking my pretty shapes into lots of a dozen, and then tells me to make them for four or three ‘beats’. He has never said how far apart these beats are. One second? Two? And how about this little group of twelve that is to be repeated until the end- how long is that? I could put on a timer if I knew. I’m good at timing. Doing things without proper rules? Not so much. 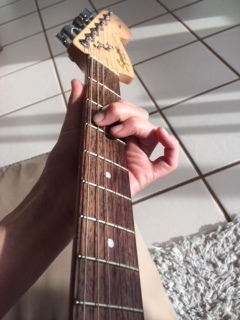 I googled all sorts of things about tabs vs chords, about the length of a bar, about where to hold the strings down. The information was strangely elusive for a discipline that is purported to be based on simple rules. I sought the advice of the children. They are how somehow imbedded with the knowledge, from years of music lessons imprinted on open minds. Which means that they don’t know the specifics of the questions I’m asking. They just look at me strangely and shrug, whilst blowing, banging or strumming familiar tunes. “You just listen to it and play it, Mum,” they say. Which is exactly what they do, and precisely what I can’t. I asked Liam a question about the production of a particular notation on the music sheet, and he sighed, picked up the guitar and said, “This should explain it.” He proceeded to play some notes (I guess they are called notes), that kind of sounded similar (where they the same?) down the neck of the thing. “See?” he asked, expectantly. I had no idea what he was on about, so I just nodded my head. This seemed to satisfy him. So at least I still know how to act like a ‘good student’ regardless of any actual learning taking place. All I can say, is Playstation, you have a lot to answer for. And Real World, you are nothing like the virtual world makes you out to be. I think it’s time to go back to Guitar Hero. I hope we didn’t sell it in the garage sale. Have you tried to learn anything new as an adult? Is it hard? And by the way, how good is Playstation? Today we had Double J playing, and “Size of a Cow” by The Wonderstuff came on. I was singing along, I guess I know most of the words (or at least my version of them, which may vary from the intended, but that’s not a new thing) and Nath was just looking at me. He said he’d never, ever heard it. That was weird. We are the same vintage, had lots of the same friends, and came from the same town, so usually we know the same songs. We varied a bit in taste, back in those teenage days- I was more Billy Bragg and Bob Dylan, he was more Rolling Stones and all of the other headachy Blues stuff that makes me doubt my ability to be happy ever again. But usually we kind of cross-over a little. And a similar thing happened last night- we were doing the random scroll thing on our iPods- you know where you close your eyes and flick and point and then have to listen to whatever comes on? Well, “Death of a Disco Dancer” (The Smiths) came on. Nath didn’t know it at all. I can understand why- Morrissey is painful at the best of times at that is a particularly moan-ey song- but still. Never, ever? That felt a bit wrong. So if he doesn’t know those two songs- I mean, to not even have heard them- then what else doesn’t he know, that I do? Of course there is all of the professional information that we each carry- I don’t think that either of us knows the intricacies of each other’s work- but what other world stuff? When we play Trivial Pursuit we are fairly evenly matched- I know a bit more Science and Lit, he knows more History, and don’t even talk to me about the Geography (I’ve been waiting for Google Maps my whole life), but we are fairly similar. I sometimes say, “How did you know THAT?” quickly followed by, “and who wants to know anyway?” Because I don’t like to be wrong. When we talk about tv shows, movies, places, pubs, people, there is a calming reassurance that is like coming home. We nod our heads at the same bits. We know the same jokes, the same streets, the same beaches. This afternoon I did that thing where you twist a wet towel into a whip and then flick someone with it. I was going to show the kids, because: life skill. I said to Nath, “Remember how there was that Collingwood footy player, maybe like Des Tuddenham or someone, who they said got testicular cancer from a towel flick?” Nath was very adamant that it was Peter Crimmens who played for Hawthorn. I don’t know anything much about footy, and I don’t have testicles, so I suspect that Nath is right, but it bugs me that something is off. That something happened in the world, and we have completely different representations in our brains about it. I know it is most probable that I’m wrong, but my neurology has created a very clear picture of a Tuddy and a Collingwood jumper in my head. So I guess I’m muddling up and mooshing together some news item/ Urban Myth, and a scene from The Club. I bet it happens a lot. So tonight we watched Countdown together, and, quite frankly, it was a relief. We knew the same songs. We thought the same outfits were ridiculous. We reminisced about cold Sunday nights in Melbourne, huddled around the fire, having Heinz tomato soup (with white bread dunked in it) and watching Countdown with our families. Waiting to see what Molly would do wrong. Hoping to see our favourite band in the Number One spot. Tonight we sat in our own home. Sweltering in the Queensland Spring, singing along to the songs of our youth. The songs that everyone knew. Back in those days there were no obscure bands, or at least not in our suburbs. Everyone watched Countdown (except Joanne Mifsud, because her Mum said it was too rude), and everyone knew all of the words, all of the music. Countdown made us part of a gang. We could recognise each other in the harmonies. It felt just right. Nath just looked at me, eyes a little wide, and didn’t say a.single.thing. I think he knows I’ve had enough shocks for one day. There’s no need to tell me what the words really are, no need at all. I might blow a fuse. 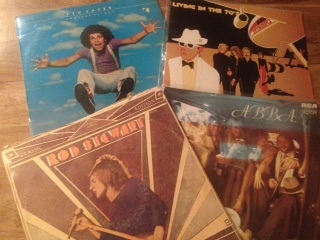 Excuse me whilst I give these old records a spin. How RUDE were the Skyhooks?!! Did you watch Countdown? Who was your favourite band? Today I had a feeling of overwhelm. You know those days, when the whelm just threatens to go over you all day? I had no idea of the source, so I just went about my business. 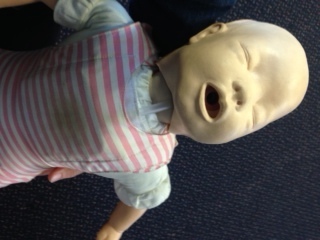 I had a First Aid course to attend, and it was okay. The young presenter was a nice young fella, and he kept the information relevant and as interesting as these kinds of refresher things can be. The content was moving along smoothly, we talked about all things cardiovascular and defebrilley until it was time to get out the mannequins. The demonstrator got out the adult torso and showed us how to compress the chest to a one third depth, to the tune of Stayin’ Alive (One hundred compressions a minute) followed by a breath. No sweat. Then he got out the kid torso. I’m not sure if it was the way he picked it up, cradling it carefully like it was an unconscious child, or if it was because, as he lifted it up I flashed back to the time when Coco had a general anaesthetic, and I held her, as she went off to sleep. But that was like no sleep I have ever seen. Her head lolled back and her eyes rolled back in her head, and she was literally a dead weight. Not a good thing to be thinking when you are handing your child over for surgery. I fought back the tears in case there was something in the theory of energy transfer and she would absorb my fears. I kept on thinking, “dead weight dead weight”, then, “don’t think dead, don’t think dead”, and then of course my brain couldn’t think of any other word. So as our instructor lifted that tiny little torso onto the table to show us how we might bring it (her?) back from the dead, I nearly lost it. My eyes started that burning that means I’m close to crying and I all I could think was, “don’t cry he will think you’re nuts, don’t cry he will think you’re nuts” and then of course my brain just heard crycrycrycry. The child mannequin that did not look like a child at all. Except to me. So maybe I am a bit nuts. Or have a wild imagination. Or both. Then tonight I read Eden’s blog, and I cried for real, so I decided if I was already crying I might as well be nuts as well, so I made a video of me trying to lip-sync to The Black Widow. I don’t know if if will help Eden at all, but it helped me. Turns out that maybe Eden is right, and music is up there with food as one of our basic needs. Maybe you could give it a try today too. Let the world hear your song. Have you entered yet? What is “your” song?